We’ve arrived to a day and age wherein I don’t understand how someone can’t appreciate Grenache–if not love it. 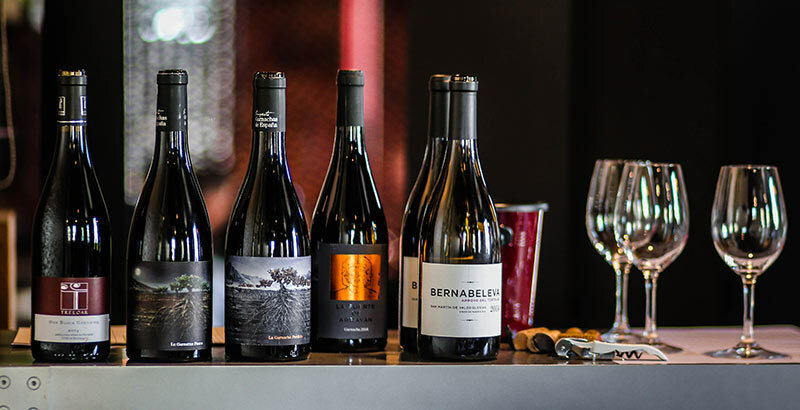 Sure, there are people who are going to only like white wines, or wines with a bit of residual sugar because they’re “smoother”, or then lighter alcohol reds like Pinot Noir, but Grenache, in our modern times has become a fine, classic grape. You don’t have to love it, but if you’re a wine lover, you should at least respect it. It wasn’t always so as historically it could be very rustic, high in alcohol, and as in-your-face as a used-car salesman in suburban California. I completely understand these long-held prejudices if that’s what has been your association with Grenache. But we’ve like, so totally moved beyond that and Grenache now comes in many shades and styles of the grape rainbow. I bring this up as I greatly enjoy fostering inter-vinous communication, not just out of my own interest, but also for others. All of the best winemakers I know are constantly “wine curious” and regularly taste outside of their safety zone. To date, one of the largest tastings I helped with was one to connect Catalan wineries and those in Châteauneuf-du-Pape. That was very Grenache-centric and very interesting on many levels. This is also why, when at the end of February a friend who is one of the organizers of a newer wine fair in Zagreb, Croatia called, the Vinart Grand Tasting invited me to attend and told me I could do a tasting of my choosing, it seemed fitting to do a pan-Grenache exposé. I make it over to Croatia every year to stay abreast of the vintages (as well as update the Dalmatia wine book) and I believed the moment had arrived that they would be ready to sink their teeth into Grenache; I might add that this is a grape that could do well on the coast of the country as well but is hardly planted. I rounded up a number of bottles that were from the center of Spain up to the south of France and brought them with me to let people see what this grape could do these days. There were of course key similarities between the wines. After all, Grenache usually has red fruit notes, a general crispness (think raspberry) despite being medium in acidity, wild spices, at times rather high alcohol, lighter color, and indeed lighter body. So with that in mind, it forged an interesting journey that took us both through the expected and the not so expected. I was excited to taste this wine as I’d last tasted the 2013 vintage for an article in Decanter last year and it’s a much lighter take on the grape than what people might expect. “Garnacha for Grenache haters” I’ve seen it called and with good reason. From a small, 1.2ha plot that’s 65 years old on granite soil (like much of the Gredos Mountains) it is indeed a very delicate and subtle wine. I perhaps found the 2013 more bright and expressive, but winemaker, Marc Isart did a lovely job with this vintage and, without much mucking about has produced an elegant, refined take that very much shows the region well. I have a renewed love of Arrayán. While I tasted the wines years and years back, this was before the arrival of the current enologist, Maite Sánchez. Like with Bernabeleva, I had a chance to visit the cellar for this Méntrida article in Decanter and if you have the chance, try both the Abillo Real and Petit Verdot as both are excellent. But in the case of this Grenache, it’s made using various grapes from around the area and the resulting blend is stupendous. I gave it 94 in my article last year and Sarah Jane Evans MW did as well in an article from this year. The 2014 has a bit denser red fruits, orange peel, and chalky minerality in the nose. The lift to it undoubtedly comes from the quite surprising pH of 3.35, but again, a solid wine and at 12€, a righteous bargain. This is an interesting project wherein the group behind Vintae has created Proyecto Garnachas de España where they’re working to find various old plots of the grape to feature as single vineyard, varietal bottles. The one from the Pyrenees has a good deal in common with that of Bernabeleva. It’s from the very top of the Zaragoza Province at 800m in altitude and has very low production. Again, like the Arroyo del Tórtolas, it’s lighter in alcohol and color, it carries a very fragrant set of aromas to it. 2015 was obviously a good year for this area, like most all of Spain as it also holds good structure in the body without being the least bit heavy. Nice bottle this one. Then there was La Garnatxa Fosca del Priorat which was from the southern part of the Priorat denomination. This is an interesting wine as while it’s from the village of el Molar, it doesn’t taste like a wine from there. The heat I normally associate with el Molar, Bellmunt, and parts of Falset, isn’t present and it’s a very evenhanded wine. A good deal of that was probably due to the muted vintage of 2014 but it’s still plenty expressive and when we came across it in the tasting, the light hit of signature Priorat rusticity and a touch of volatile acidity really made it jump out of the glass, but in a good way. So then we journeyed up to just across the border in Roussillon which some 350 years ago used to be part of Catalonia and to this day, there’s a lot of shared DNA in the winemaking as most of the grapes are essentially Spanish. Johnathan Hesford is the winemaker/owner and I’ve written about Domaine Treloar before and what the man is doing with his winery increases in craft and agility each year. In that article linked to, I wrote up a review of the 2011 One Block Grenache. In this iteration of the 2014, we’re talking about a very different wine. While a blend of “regular” and Hairy Grenache (officially Carignan as well but, right…) it’s the Hairy variant that’s really singing here. That peppery anise quality is redolent and this is a damned fine, mighty expressive wine at this point and I can’t wait to taste the 2015. If the price is still around 8€, it’s an even bigger steal than the wine from Arrayán. Ultimately, it seemed that everyone who attended the session at the fair walked away quite happy or at least I was very pleased with the resulting wines that show Grenache is more than ready to stand up on its own as a beautiful varietal wine.